For more than a decade, Razer has peddled aggressive, brightly colored peripherals and PCs to people who cared more about frame rates and kill death ratios than mainstream appeal. 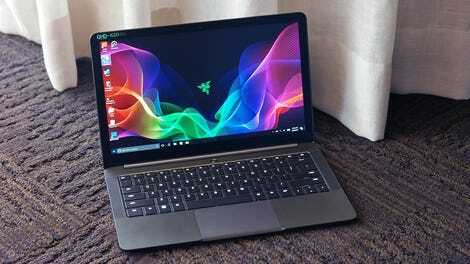 But when Razer launched its first ultraportable laptop last year, it was a very different, relatively game-free story. Now, the Stealth is back with an even more refined design and a slightly bigger screen, but it still isn’t any good at playing games—and there isn’t even a speck of neon green paint on it. That’s very not Razer. Our $1,399 gunmetal gray review unit doesn’t even feature the colored RGB backlighting that Razer shoehorns into practically everything it makes (including its motherfucking coffee mugs). But you know what? That’s just fine, because the Blade Stealth is the MacBook Pro clone with Windows I’ve always wanted. A very non-Razer looking Razer laptop. Now, before you get all upset about someone calling yet another aluminum-bodied laptop a MacBook clone, come on. Just look at it, from it hinge to its speaker placement and even the indent on the front of the system, the similarities are unmistakable. Even the colors are pretty much the same; gunmetal is what people used to call space gray before Jony Ive Apple-fied it. However Razer has made some subtle, but important deviations from Apple’s formula, like the inclusion of both types of USB ports, which is a nice way to bridge the gap between legacy tech and new peripherals. You even get a full-size HDMI port, so you don’t have to carry around a stupid dongle in case you want to connect the Stealth to an external display. And while the Stealth’s touchpad is significantly smaller than the one on the MacBook Pro, there’s still plenty of room to get things done. The only way to get that sweet RGB keyboard lighting is to go for the black model. All you get on the gunmetal model is white. Then there’s the Stealth’s keyboard, which is way better than the super shallow setups you get on modern Macbook Pros, and there isn’t any of that Touch Bar nonsense to deal with, either. You can actually type on it for prolonged periods of time without clubbing your fingers into mangled sausage-shaped messes. However, I think not including Razer’s fancy Chroma backlighting on the gunmetal model is a big mistake. To get that multi-colored sparkle back, you’ll have to opt for a black Stealth. If Razer had gone full RGB with this keyboard, there’s nothing stopping people from making all the backlights white when they want to hide their power level. Then, when you get home and want to relax, you could always turn the rainbow back on and relax to the pulsing, blinking, or breathing of a thousand different colors. I’m not gonna lie, the Stealth is pretty handsome. Inside, the Stealth has the kind of specs you’d expect on a $1,300 ultraportable notebook, including an Intel Core i7 CPU, 16GB of RAM, and a 256GB SSD. The 13.3-inch 3200 x 1800 screen has a nice feather in its cap thank to its included multi-touch support, which is still something you can’t get on any MacBook. You even get 802.11ac Killer Wi-Fi that could help prioritize your gaming internet traffic, assuming you were actually trying to game on it, which you shouldn’t. That’s a pretty nice selection of ports for a 13-inch laptop, and that’s just the left side of the Stealth. That’s because the Stealth relies on integrated Intel HD Graphics 620, which puts out anemic graphics performance at best. Editing a photo or video or two is fine, but when I tried to play Civilizations VI at 1920 x 1080 (not even its full native resolution) and minimum settings, the Stealth struggled to even hit 11 fps. That basically means you’re limited to 2D games like Hotline Miami (which everyone should go out and play) or Stardew Valley. The only way to improve the experience is with an external graphic set up like the Razer Core graphics amp or one of those ones Apple plans to push now for use with its own laptops. But currently options are severely limited. Being able to avoid carrying dongles around is a big plus. Speaking of options, there really aren’t any, which is kind of a bummer. It would be nice if you could opt for a Core i5 CPU or 8GB of RAM while knocking the price down closer to $1,000. But the only real choices you have are colors (black or gray), and how big of an SSD you want. Thankfully, the standard 56 Wh battery is decent, as it lasted 8 hours and 49 minutes on our battery rundown test. That ain’t bad, but it is slightly shorter than times from systems like the 14-inch LG Gram (9:44) and last year’s Dell XPS 13 (9:47). 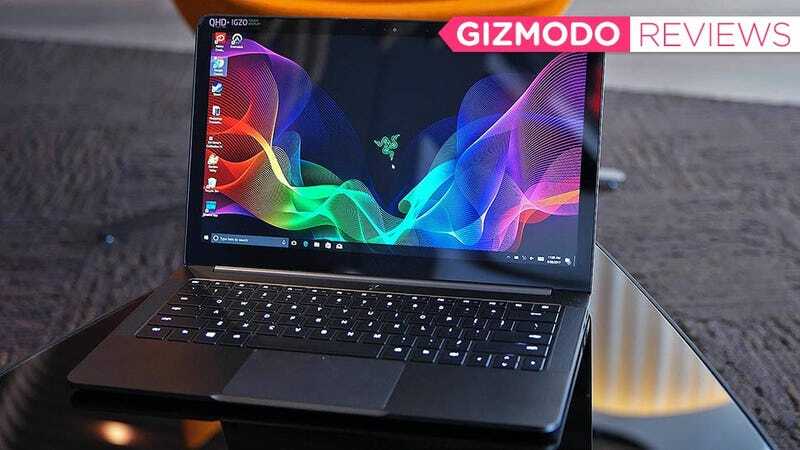 But for someone like me who has never been able to truly get down with Apple’s Leopards, Mountain Lions, or High Sierras, the Razer Blade Stealth is the 13-inch laptop I always hoped someone would make. It’s got the kind of sleek design and rock solid build quality I’ve already appreciated about Apple’s MacBooks, with an OS I’m more comfortable with and a number of tweaks that make this Windows machine much nicer to live with. With the Stealth, it feels like Razer finally is growing up a bit—I just hope it doesn’t go all the way into the no-fun zone so I can get my RGB lighting back. This thing isn’t really meant for gaming. Slick, more mature design (for Razer). Battery life is fine, but not great. Gunmetal model doesn’t come with RGB Chroma backlighting on the keyboard. Priced comparably to other premium ultraportable laptops, but there aren’t a lot of configuration options.